Invigorate and energise your staff, while showing them that you appreciate all the work that they do. 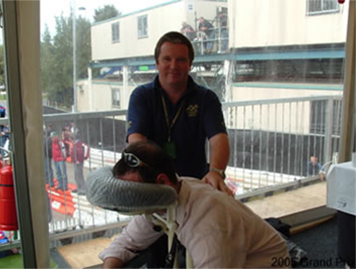 On-Site Massage has been providing office chair massage services to corporations in Melbourne CBD and regional areas of Victoria since 1997, so we know all about the real benefits that this can bring to the workplace. Your employees are your greatest asset and you want to do everything you can to keep them feeling happy and working to their capacity. 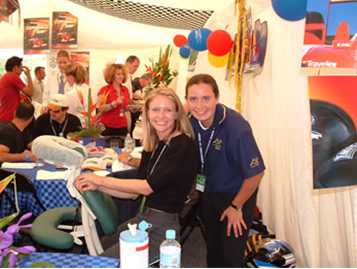 By providing a professional corporate massage, Victoria businesses can flourish, without losing much time at all. There’s no need to leave the office – our qualified massage therapists come to you. Each massage is performed through the recipient’s clothing in a specially designed massage chair that can alleviate neck, shoulder, back and arm tension. Create a talking point and prove that your business is a great place to work! Whether you want to schedule regular corporate massage services, or want a one-off visit from our massage therapists, On-Site Massage keeps it simple. 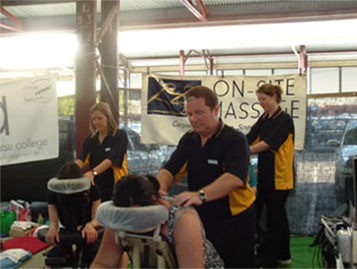 Contact us online or give us a call on 0411 519 174 to enquire about organising a corporate massage. Victoria regional areas and Melbourne CBD businesses can finally show staff the appreciation they deserve with an invigorating service that benefits both them and the operation of your business. How easy is it to organise? Pricing is easy at just $70 p/h +GST.